David is searching for his mother. Only you can help us find her. When I ask David to describe his ideal family, I expect a typical kid response – a parent who plays basketball, gets pizza on Fridays, maybe takes trips to the beach on the weekends. He shrugs, and keeps his eyes on the wall across the room. “Oh whoever. I’d take anybody.” His voice tough but resigned, having refined this answer hundreds of times in the eleven years he’s been in foster care. I explain that there are no limits, I’m just getting an idea of what kinds of portraits to make to attract the right parents. He stammers, trying to get his words out. Kelsey, his case worker, tilts her head, “David – you didn’t tell me this before.” She shifts through papers and takes notes. He just wants a mom. In an ideal future with no limits, David’s wildest dream is to have a mom. David is 13 years old. Do you remember those self-conscious days, pretending not to care about the things that matter deeply? He’s expressing his childhood dreams with adult pragmatism. The logistics – what is the minimum he can ask for? How can he express his hopes without without risking more rejection? He didn’t ask for a rich and beautiful mom – or a mom who encourages his love of science. Not an astronaut mom, or a saintly mom who makes home-cooked dinners. Just a regular, imperfect mom – like one of us. He is asking for something almost every one of us takes for granted as a birth-right. Sure – any parent would give him a steady place in the world, a bed and a basketball of his own, someone to help him with his college applications, to nag him about wearing a jacket and to tell him to clean up his room. He’s not picky. He would love anybody. 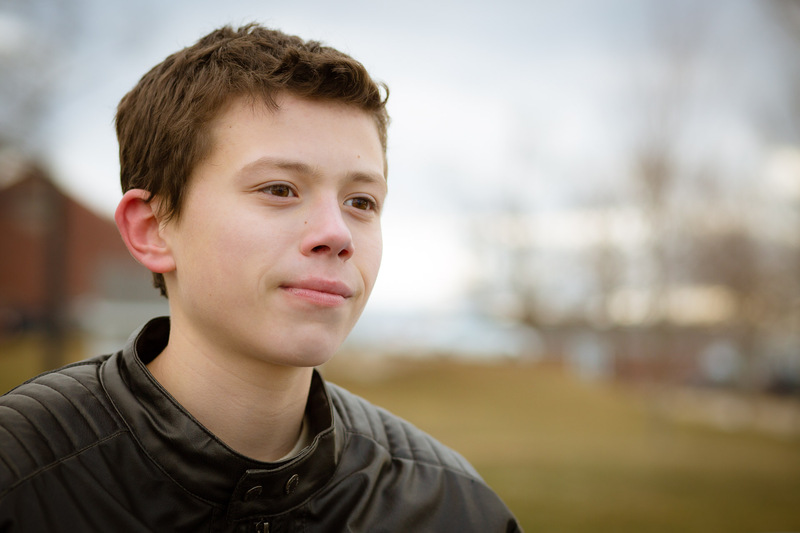 After eleven years in foster care, David has given up asking. He can’t afford to be picky. Anybody would be better than the nobody he has now. But we’re not looking for just anybody. You – the mother who appreciates his goofy faces. You – the one who smiles to see him daydreaming and listens to his ideas. The one who notices the subtle ways he shows kindness for others, and who can help him maintain that kindness as he grows older. 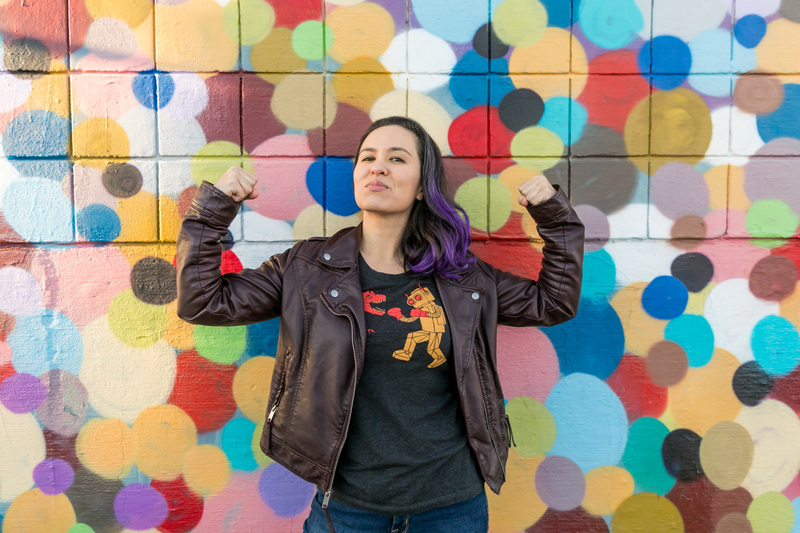 He needs someone who will cheer him on at basketball games and encourage him to join the rock climbing team, who will channel his boundless energy into greatness. He needs someone who sees him and celebrates his awesomeness. Do you see your son? 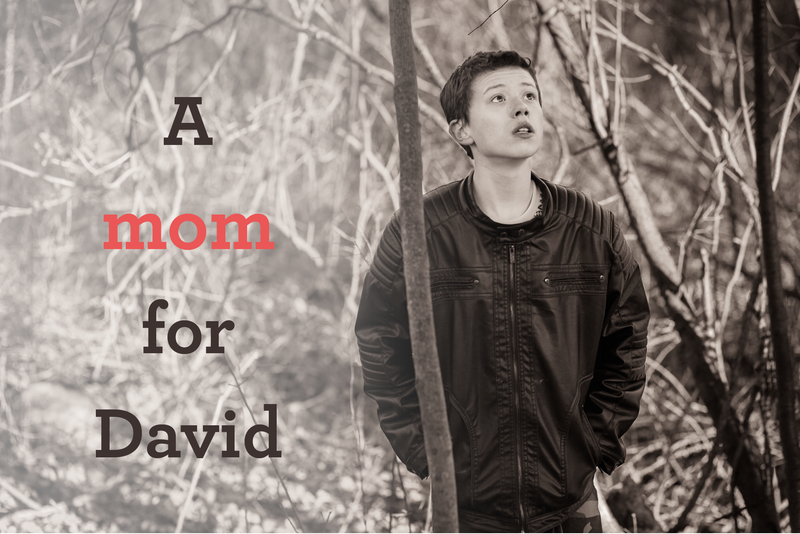 David’s mom – Are you reading this? He has been searching for you. The air is just a few degrees above freezing, deep in the rolling hills of central Massachusetts. David opens the door for me as I enter the main building of the Dubois program,* a group home he has been placed in for the last two years. He’s dressed in a faded pair of camouflage pants and a thin, over-sized jacket that makes him look 60 pounds heavier and four years older. His shoes are at least two sizes too big, and as he walks, then runs, then scrambles up trees during our session, he clomps like a Labrador puppy with paws he hasn’t grown into yet. He’s tall, standing eye-to-eye with my 5’2” frame, although I outweigh him by at least 20 pounds. He has no gloves and the biting wind turns his ears and fingers a deep, chapped red. I resist the motherly urge to wipe his drippy nose in the frigid wind and throw my jacket around him. The basketballs are locked up, so we brainstorm somewhere fun to start our session, an open place he will have room to move. Kelsey suggests the swing sets dotting the Dubois grounds. “Nah, these ones are all beat up and junky,” David defers, suggesting a public playground up the street. I have to agree with him. The bare-bones steel swing sets I parked next to are depressing. The buildings and grounds of the facility are stark. “Dubois is banned.” David informs her, in the same tone I’d use to tell her there’s a ramp closing on the Pike. “A kid from the program got into a fight and now we’re not allowed.” There is exhaustion, even a little frustration in the statement, but no anger, no injustice. Kelsey and I are both silent. We don’t point out how unfair this is. What is the point? David has no control over policies like this – or anything in his life, really. When I asked him how he expects his life to change after he’s adopted into a family, he says he would wear his own clothes, not some random stuff they hand him. His clothing, along with everyone else’s, had been taken for sterilizing earlier this week while the rooms were fumigated. The kids have been sleeping in a gymnasium. He imagines a life where he chooses what he eats, and when he eats it – something Kelsey pointed out might not change in a family, since he’s still a kid. In expressing his wishes for a perfect family, David didn’t ask for pizza Fridays, because family pizza nights are beyond the scope of his experience. When he says he wants to choose what he eats, he doesn’t mean unlimited ice cream at midnight, he just wants a say, some level of control over his life. After eleven years of breakfasts, lunches, and dinners from a cafeteria, he wants some input on his pizza toppings, to enjoy food that isn’t served from a tray. The playground is squishy with patches of mud and the ice is melting slick. Before I pull out my camera, David has already picked up a large piece of jagged plexiglass on the tot structure and is trying to fit it back into place. “I hate it when people do this,” he sighs, trying to fix the un-fixable, “kids could get hurt.” He gives up and decides at least he can move it away from where the kids play. He places it gently outside the fence. As I adjust my settings, David climbs the tallest slide he can find, grinning, while Kelsey cheers him on. He’s in his element now, running and climbing, savoring Kelsey’s attention, his shyness gone. I turn my camera on him. He freezes, and gives me a nervous, flat smile – the smile that says “Hello, ma’am, I am a friendly, agreeable child. Please take me home.” This is not the smile that will help his mother see who he really is – how vital he is to the beating of her heart. David’s mom – are you out there? Have you seen him yet? I humor him and click the shutter, then lower the camera. In seconds he’s on top of the playground roof, then back down again, now standing on top of a rock wall, surveying the landscape for a new challenge as I click the camera from the ground. I hop onto a picnic table to get a better angle and slip a little. His energy is catching and I had forgotten I’m a grown-up, with slow, grown-up reflexes. Before I can regain steady footing, he’s already back down and running to the chain-link backstop of a baseball field, trying to wedge those enormous shoes into the tiny links, climbing higher despite them. He hoots like a monkey to make Kelsey laugh. 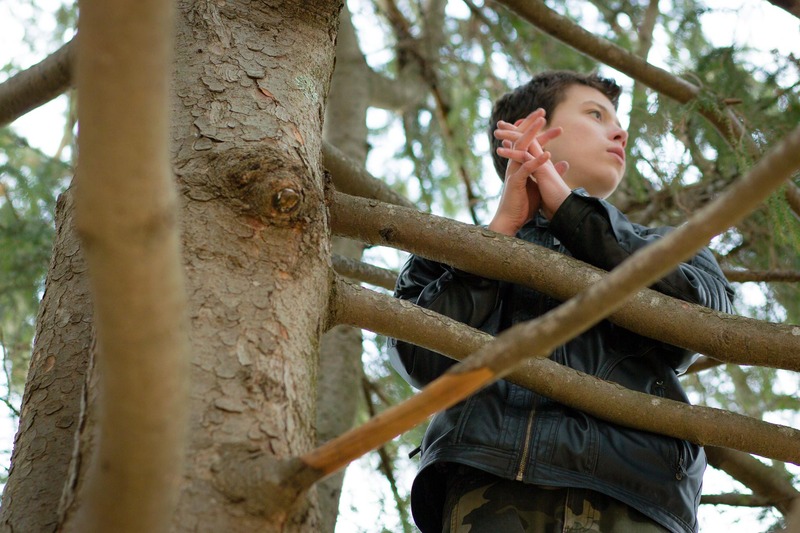 This entire time, he’s been narrating his adventures, thinking-out-loud about how high he should go, what he should climb next, how cold the monkey bars are. He hops down from the backstop and pauses a second. Spotting a tree in the distance, he takes off, and we run again, slipping through the mud and ice. I follow him, laughing, watching him revel in the open space and adventure of conquering the next challenge. As we run, I ask if he plays any team sports. “Well, I tried out for basketball,” he said, “but I didn’t get picked. I don’t know why – all the directors said I showed up to every practice, and I passed the ball more than anybody!” I agree, that sounds confusing. He shrugs, and keeps running. 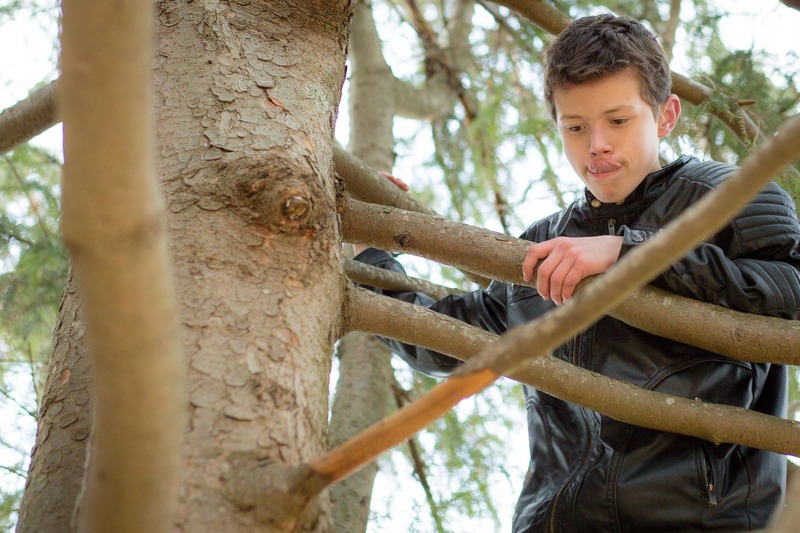 Cheeks red from the cold and exhilaration of play, he climbs a large fir tree. He gets as high as he dares and then traverses the branches like an obstacle course. I ask him if he watches TV. “Oh, yeah, LOTS” he replies, rubbing the tree sap off his hands. I ask him what he watches, expecting some inane MTV program interspersed with ads for Axe body spray. David follows this up with a comically accurate impression of a preschooler, jumping up in the branches, eyes wide, chanting for Thomas the Tank. Hiding behind my camera, I consider it’s like to have grandparents with the resources to take only one of you. – and to be the one left out. He stops, turns to me and gives the camera that ‘hello-ma’am’ smile. It’s not a reflection of him, but the effort and sweetness behind it is. I take the picture so he can get back to having fun. Just before he climbs down, he turns to look over his shoulder at me. There it is. There he is. 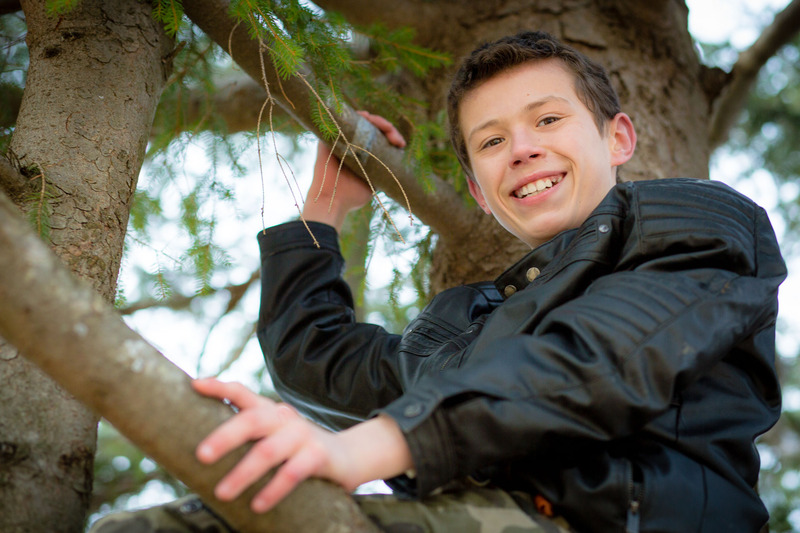 He climbs down from the tree and stops to check in on Kelsey, who is swiftly turning into a popsicle on the park bench. She urges him to warm up in the car, but he has eyes for the baseball dugout, or rather, the puzzle of how to climb it. Swinging his feel happily from the roof, he daydreams out loud about an imaginary sunset, chuckling, he gazes to the distance. Kelsey chats with him from the ground. They get along and he loves her company. He pauses quietly for a moment, leans forward and rests his cheek on his legs like a little kid, finding comfort in something I can’t see. For the first time I realize that David has been a teenager for less than a year – he’s still closer to 8 than 18. Kelsey suggests we get some indoor portraits before I head home. We wait several minutes at the front desk to ask permission to use the cafeteria – the only building on the grounds not locked down. The receptionist is busy answering questions and searching for keys, and finally David tells Kelsey to just follow him. He leads us out the back door to a small yard behind the main building, where the woods drop low into a valley. There are brambles and leafless trees featuring bits of disintegrating string looped around trunks and over branches. “David, where are you taking us?” Kelsey asks, “I was hoping to go to the cafeteria, so we can get indoor pictures.” The space is dingy and the steel picnic bench doesn’t look comfortable. David waves her off and starts giving an animated tour of the brambles. The vegetation is prickly and brown, hiding the lush forest of evergreens beyond. “The kitchen was here,” he says, gesturing to the space where the trimmed lawn met a thick layer of fallen leaves. I’m confused and having a hard time following him. Was there a renovation? “And back in the day, the basketball court went from this tree here, all the way over there.” He points, excited and proud. The tree he gestures to is clearly older than him. There was no renovation. David had taken us to his Neverland. David welcomes us to his favorite space, spreading his arms wide. He warns me to watch my step – the ground is soft and uneven, pocked with deep holes camouflaged with years of leaf fall. Familiar with each inch of ground, he steps confidently, detailing a rich history of glorious battles. “We made these walls of string – you should have seen it!” Every few steps, he wrestles a stick out of a vine, reminisces over its historical significance, then sighs, and casts it deeper into the forest. He wanders deeper down the valley, and the terrain becomes too tricky for me. I head back and join Kelsey on the lawn. Finally he runs back up the hill to join us. “The mighty empire of Sparta has fallen,” he sighs ruefully, surveying the crumbling remnants of his empire. “Sparta has been sacked by the evil forces of Dubois, and now it is no more.” He repeats this to himself quietly, a couple of times, enjoying the romantic words of bitter tragedy. I ask him to stand in a patch of light as the sun lowers behind the trees for a last set of pictures. Tragedy forgotten, he swaps jokes with Kelsey over my shoulder. “Why do seagulls fly over the sea?” he asks. Before we part ways, I take a last shot of this sweet, energetic, imaginative lost boy, laughing in the golden light. Could this be your son? 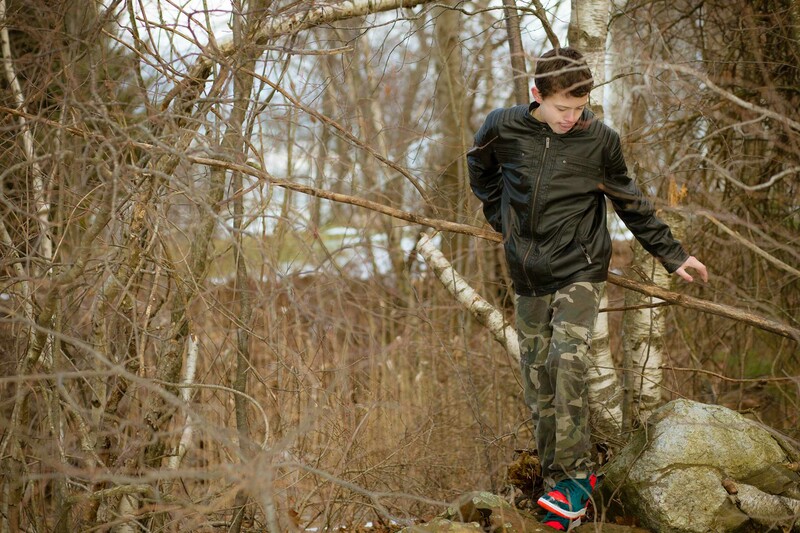 If your heart recognizes the boy in this picture as your own, click here to email nicholel@mareinc.org or call 617-542-3678 to speak with Nichole of the Massachusetts Adoption Resource Exchange (MARE). Make David’s wildest dream come true. It’s finally time to bring him home. 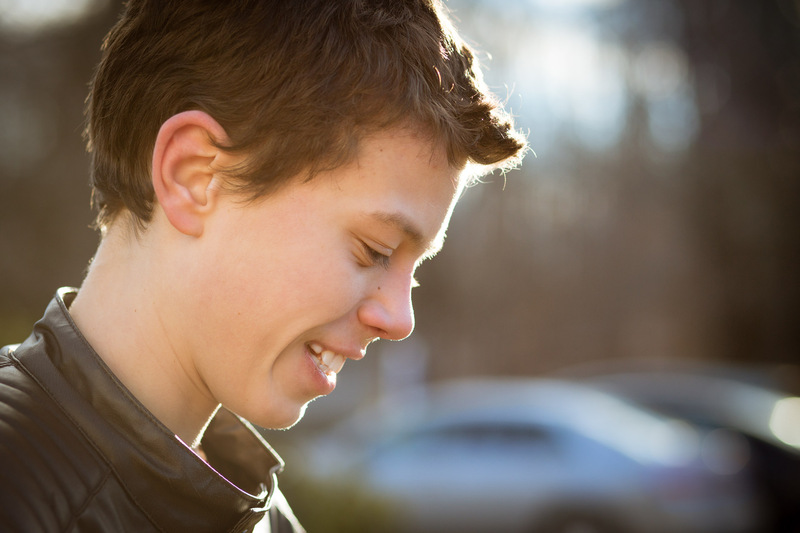 David has been in foster care since he was two years old. It’s time to find his mother. You can help. You can be a hero in less than one minute. It takes just one step to help David’s wish come true. You can be the person who unites a family. Share his story. Help this family find each other. Share his story not just with potential moms, but with everyone. You might not know David’s mom, but you might know someone who does. Post a link to his story on your Facebook wall, your twitter feed, and your blog. Email it to your friends, family and co-workers. Leave a comment to let me know you’re making a difference. Let’s get this kid home before he grows into those shoes. OK? OK! For more ways to help youth in foster care, find an opportunity that fits your time limitations and budget. Everyone can do something – even if all you have is five minutes. Click here to read more updates on David’s story and find out how to help. * The name of David’s group home has been changed to protect his privacy. David’s on TV! Check out his segment on CBS-Boston’s Wednesday’s Child! Sharing. Good luck David, it’s been too long without your family. I hope David is able to find his family soon. As an adoptive mom & a bio mom, I can say that the love I feel for my boys is equal in every way. I hope he finds his mom and family. I shared this and hope it helps! I hope he finds a loving home soon. I felt a twinge of temptation looking at your photos, despite it being extremely impractical for us! Shared. In tears. I so wish I could adopt this awesome kid. I live in Central MA too, and I’m a single parent with a 12 year old with special needs and chronic health issues of my own that make parenting just one child very challenging. But I’d adopt him in a second if I knew I could responsibly do so right now. I have always wanted to adopt an older child and life just didn’t work out that way in the end. I can’t stand the thought of a kid growing up that long without a family. Praying that he finds the forever mom he so much deserves. What else can I do to help kids like David know they are loved and supported? I’d like to do the birthday gifts and cards, but what about when it’s not their birthdays? My own daughter has spent time in placements similar to group homes due to her complex needs, and I have some idea how lonely these places can be. Beautiful photo essay. My favorite shots are the ones with tongue out because they echo my own family photos :) It made me pause because along with his quirky smile and invitation into his magical world, he could be part of my tribe. I wish I wish. But alas, I’m a perfectly imperfect single mom on my own journey. However, his smile will be the object of my compassionate and joyful attention which might just help him a little insy bit attract his perfectly imperfect mom! I have also shared on Facebook and will be reaching out to Nicole to see what my family can do to be of help to David and others in similar situations. Thank you for the work and love you put into David’s story. It is beautiful, he is beautiful, and I hope that it helps him find his family soon. Any updates on David? Hoping he’s found his family. As an adoptive mom myself, I know the bond between mom and child. I will do my very best to help find David’s mom and family! Have shared on Facebook and Twitter, and will share with my adoptive community. This boy is special. Wow, this is so sad to see. Why has he been in the system so long? As a foster mother, I am always perplexed at how long it take to terminate parental rights and offer children permanancy. Some children have been going back and forth from biological family to foster families since birth. And how does he have a little brother living with grandparents while he’s in care? So many unanswered questions as with most children in state care. Bless his heart. He so deserves a Mama. I live too far away to enter, but I’m advocating for him. As a mom of 5, two of whom are adopted, I want to just take him home with me. I don’t live in MA, though, so I’m not sure if he’s allowed to leave the state. But I’ll share this and pray that we find a loving home for him! My 13 year old son would love a brother like David. This story has touched me deeply, it’s tearing me up that we’re on the West Coast. All my Love & prayers that David’s mother finds him soon. If I could bring him to Sunny San Diego California, I would do it now. But I am sure he would miss home. I hope he finds his mom very soon, I know she is out there looking for him. Please keep us updated on David’s search. I am praying that the right family will see the post. Please keep us updated! I would love to help, but I am all the way in Texas. I want to make sure this growing young man is well taken care of. He deserves it! Shared, and shared by several friends. I pray this sweet boy finds the family he deserves. I will be emailing to see how I can help until he does. Thank you for sharing his story. Shared with fingers crossed – thank you for posting. We would love to do something for his birthday! What does he like/ enjoy? I sent an email. I hope it’s me. I LOVE being a mother – I am sure there is a mother out there -one who wants to LOVE being a MOM- just waiting to become ‘David’s Mom’ and she will be the best mom in the world. I have plenty of room in my heart but not the physical room in my home We are sending him some birthday presents from the Ward family. This moved me to tears, in a big and powerful way. If I still lived in New England I may have found myself driving to David immediately upon reading. I shared this story and I hope with all my heart he is welcomed into a loving home very soon. Sending so much love to you, David! I wish I could be your mom! I emailed. I’m in NY and I hope he finds a local family who will love h forever, but my daughter and I are happy to be a backup plan. We’re going to arrange a home study. Thank you for sharing his story. More, please. We need to hear these kids’ stories. What an amazing beautiful boy. I’m a kinship foster parent in the process of adoption. I’ll be reaching out to his worker to see if I can help in some manner. David is an incredibly resilient child, the simple fact that he has been able to hold on to his boyhood while being in the system for so long is miraculous and heart warming. He is a very special child who deserves the love he longs for. Poor baby just wants a Mumma. So many kids take that for granted and it’s all he wants. I hope sharing helps. This is so beautifully written. It could be written about how many foster kids like him? I deeply hope he finds his family soon. And wish the grandparents could be supported to help have him reunited with them as well. So many solutions that are not being worked on. How many kids are not with families because of “poverty” in general? I’d likely be ineligible because of my low income. I am adopted and have always wanted to adopt. I’m not fully sure anymore because I’ve had four kids of my own and have some health issues! And am a single mom. But if things shift just a bit… I’ve also wanted to adopt a “sibling group” but would prefer to do so with a partner than as a single parent… Shared on FB. This is so beautifully written. I cried when I read it and dearly hope David finds the home and mother he is looking for. I’ve shared his story on my FB wall and would love to do more – I will contact Nichole at MARE about his birthday. 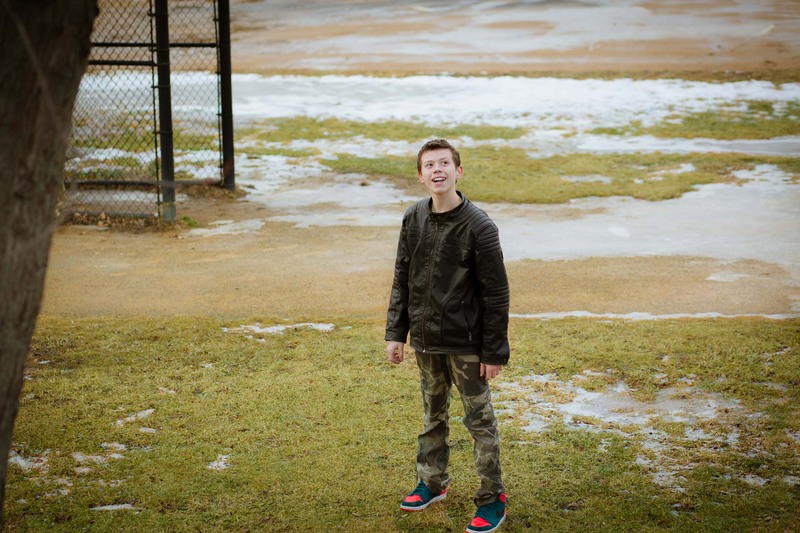 Thank you so much for putting together this project and reaching out to help kids like David. This brought me to tears!! Best wishes, Sweet David I know your Mama is out there. She just doesn’t know you have been looking for her. I’ve shared your story in hopes that it will bring her to you! This is beatufifuly written and photographed. He seems like a special kid and this special story will hopefully help him find a special family. I am the proud mother of two children adopted through MA foster care, at ages 3 and 11, now 7 and 16. I will share look forward to seeign an update. What a beautiful, sweet boy- I would so love to adopt a child. I will share this on my FB page in hopes that it will help find David a wonderful, loving, forever family to call his own. What a beautiful boy… and a heartbreaking story. So many heartbreaking stories out there. Thank you for bringing some very special attention to this young man! .. and please do it again and again for others.. Good luck finding your mama, David!